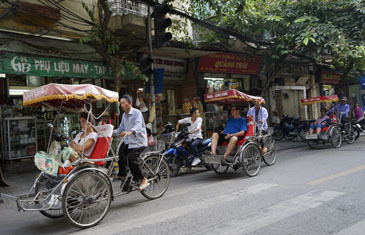 Arrive in the charming capital city of Hanoi, known for its tree-lined streets and French colonial villas. 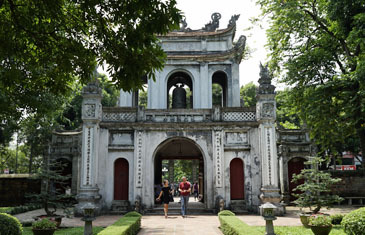 Get acquainted with the city by taking a traditional cyclo for a slow ride visiting the historic Ho Chi Minh Mausoleum, One Pillar Pagoda, and the Temple of Literature. In the afternoon, drive to Dao Thu Village, home to the unique folk art of water puppetry, found only in Vietnam. Meet an artisan of this ancient craft and learn how he and his family are continuing the tradition. Afterward, enjoy a private 30-minute outdoor water puppet show on a village pond accompanied by a live traditional music performance. Join a local chef in a morning visit to the local market to select the ingredients for a private cooking class. Experience the bustling market atmosphere as shoppers clamour in tight spaces to purchase their goods. Return to the chef’s home for a cooking lesson of popular Vietnamese dishes. After savouring your creations for lunch, travel outside Hanoi to a farming village in the Red River Delta. Meet a family of flower growers and join them in their daily tasks of watering and cutting flowers before loading them up on a motorbike bound for the wholesale market. This day promises to be a fun and engaging experience for the entire family! Depart Hanoi on a 2hr drive to Ninh Binh, a province known for its spectacular landscapes of rice paddies and limestone karsts. Visit the ancient Dich Long Cave and Pagoda, a remarkable series of temples and communal houses dating back hundreds of years. Afterward, enjoy a scenic boat trip through the wetlands of the Van Long Reserve with spectacular views of its 32 stunning grottoes. This area has recently become famous as one of the filming locations for the blockbuster movie “Kong: Skull Island”. Get a feel for life in the countryside with a leisurely 7km/4mi bike ride through quaint villages and agriculture fields. Make stops along the way to chat with the local people and observe their way of life. Cycle to a farm where you’ll spend the afternoon interacting with a local family. Take a tour around their property as they describe their daily tasks and responsibilities. For lunch, enjoy a home-cooked meal and engage in lively conversation with the family. From 1802 to 1945, Hue was home to 13 Nguyen Emperors, whose palaces and tombs provide fascinating glimpses into the luxurious and secretive world of the court. Visit the elaborate tombs of Emperor Khai Dinh and Tu Duc for a better understanding of Hue’s imperial history. After lunch, take a brief cyclo ride to explore the Imperial Citadel, a designated World Heritage Site. Afterward, join the local crowds in kite flying, a popular Hue activity. Except on rainy days, hundreds of kites can be seen soaring in the skies over the Imperial Citadel every afternoon. Visit the private home of a kite craftsman to learn about the history of this traditional pastime. Under his guidance, learn how to put together a kite before taking it out for a test fly. Spend a half day exploring the handicraft villages outside of Hue. 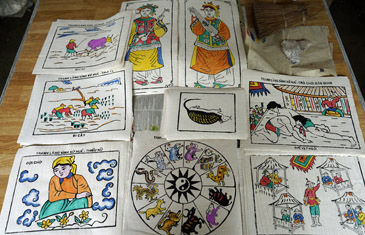 Visit Sinh Village, home to the 400-year-old folk painting craft on “dzo” paper. Meet with the oldest artisan in the village who will show you how to create your own piece of folk painting. Afterward, cycle to a neighbouring village known for its traditional paper flower making. The flowers, including chrysanthemums, roses, orchids and sunflowers, are mainly used to decorate altars for ancestor worship and as offerings in religious rituals. 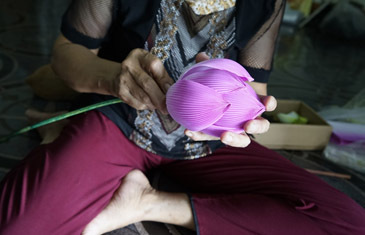 Try creating your own paper lotus flower under the guidance of the artisan. Later, visit Uu Dam Orphanage where volunteer nuns provide housing and education for orphaned children of all ages. Spend some time with the children, teaching them basic English or join them in some games. Experience of the best scenic train routes in Vietnam from Hue to Danang. A short 3hr train ride passes through picturesque countryside, then skirts on the side of a mountain as you travel along the coastline. Meet locals on board and make new friends on the journey! 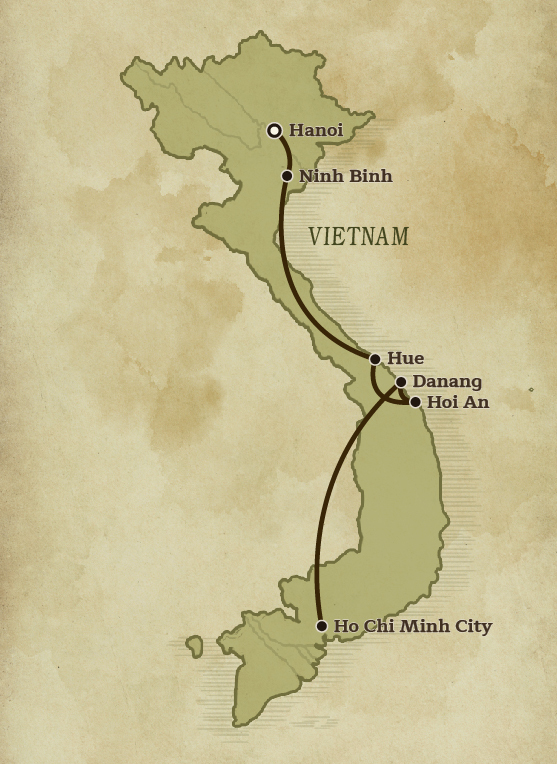 Arrive at the Danang Train Station and drive to the former trading port of Hoi An. The ancient town of Hoi An is recognised for its well-preserved architecture from the 15th-19th century. This afternoon, meet with a local lantern-making artisan whose family has been making lanterns for decades. Have fun with a hands-on lesson from the artisan on lantern making, choosing your own silk fabric, colours, and pattern. Farmers and water buffalo working the fields have become a symbol of Vietnamese countryside life. Because the buffalo is often the most valuable possession of poor farmers, they are treated almost as a member of the family. Enjoy a scenic buffalo cart ride passing by rice paddies, shrimp ponds, and vegetable farms. Meet a local fisherman and hop on his boat to try your hand at casting traditional fishing nets, a common fishing method still practised today. After lunch, visit a bamboo workshop and meet with an expert who will show you a variety of items made from bamboo used in daily life. Try your hands at making a pen holder or small piece of décor to take home as a souvenir. Take a short boat ride across the Thu Bon River to reach Cam Kim Island. The car-free island is perfect for cycling where we’ll spend half a day on our bikes exploring the peaceful countryside. Visit Tra Nhieu Village which has retained many typical features of the Vietnamese livelihoods of agriculture and handicraft making. Learn about the diversity of local plants and herbs and visit several local homes to observe how people make rice wine, rice noodles and rice paper. Continue to a scenic water coconut forest and try your hand at rowing the unique Vietnamese round bamboo basket boats. Enjoy a home-hosted lunch before returning to the mainland. A short flight from Danang takes you to Ho Chi Minh City, the country’s commercial centre with a bustling population of 10 million. Experience Old Saigon with a half-day city tour of historic landmarks from the unique vantage point of a vintage sidecar motorbike with chauffeur. Before dinner, enjoy watching the fascinating “A O” show, combining acrobatics and dance depicting traditional rural life. Discover the breadbasket of the country with a day tour of the Mekong Delta. Drive to Cai Be, known for its tropical fruit gardens and traditional handicrafts. Cruise along the river then hop on a bicycle to explore rustic villages with stops at fruit farms and local handicraft centres specialising in making hammocks, rice paper and conical hats. Enjoy a traditional home-hosted Mekong Delta lunch before returning to the city. Transfer to the airport for your onward departure. Amazing nature, ancient sites and Khmer traditions make Cambodia an ideal destination for all the family to enjoy unique educational and fun activities. Across this increasingly popular and family-friendly destination, experience authentic rural life, artisanal skills, jungle and island adventures and more for family memories to last a lifetime.